Tired of playing the plain old chords in the left hand and melody with the right hand? Wanna learn how to change it up and make your music "pop" and come alive? Then this DVD is for you! 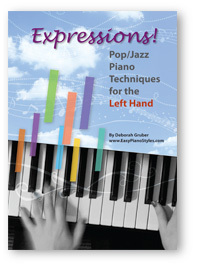 Expressions will give you Thirteen different tricks and techniques for the left hand. Everything from the blues to contemporary jazz. 1. The one technique that can apply to many different styles of playing and sounds so lively and upbeat! 2. Three gorgeous runs for the left hand that enhance any ballad. 3. An easy version of the Walking Bass so you can play any swing tune with FLAIR. 4. Two boogie patterns that will give an automatic bluesy quality and feel to your playing. 5. Four Pop Rhythm Patterns that will take your playing to the next level and add excitement and movement.